VT iDirect, Inc. (iDirect), a company of Vision Technologies Systems, Inc. (VT Systems), today announced that AMTEL-SVYAZ Company will launch the first iDirect DVB-S2X network in Russia, utilizing the iQ Series of remotes. The network is expected to operate on up to five geostationary satellites, providing coverage over the Russian Federation and parts of the adjacent seas and oceans, delivering cost-effective connectivity throughout the Russia region. AMTEL-SVYAZ will leverage their iDirect network to offer high-speed connectivity to a wide range of enterprise markets, such as Energy, Banking, Oil and Gas, and Maritime. This launch also enables the company to expand their territory and allows flexible pricing for their customers. JSC "AMTEL-SVYAZ" provides the creation of corporate and back-up satellite communication network services. The company is based in Moscow, Russia and is the parent company СJSC DOZOR-TELEPORT. AMTEL-SVYAZ works through 5 geostationary satellites and has a number of teleports evenly distributed over the entire territory of the Russian Federation. The operator's clients are commercial and state corporations and consumers. 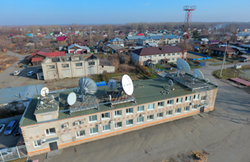 The company was first granted satellite communications services in Russia using the iDirect platform, now before anyone launches in the technology DVB-S2x in the country.